For more than 54 years Recreonics has been supplying aquatic facilities across the United States and around the world with high quality commercial swimming pool equipment and friendly, fast and expert customer service. Recreonics is the US Distributor for Wibit Commercial Pool Inflatables. Sold in over 70 countries worldwide, Wibit inflatables provide people everywhere the excitement of play on the water! Let our highly trained and experienced (Average Tenure is 23 Years) sales consultants exceed your expectations and partner with you regarding your aquatic facility needs. Recreonics, Inc. offers superior customer service, largest inventories, quickest shipping and extremely competitive prices. 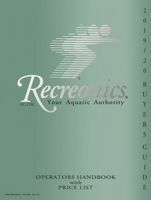 Recreonics, Inc. is the aquatic authority and we very much look forward to partnering with you. Recreonics, Inc. Buyer's Guide and Operators Handbook contains the largest selection of commercial swimming pool equipment available. Complete with technical product data, this full color, 208-page guide is an essential tool for aquatic directors, pool managers, swim coaches and anyone in the pool industry. Our centralized location, huge inventory and competitive prices make Recreonics the best choice for your aquatic needs. 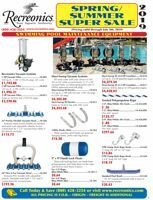 Recreonics Spring-Summer Super Sales is going on now through July 5, 2019 with great pricing on the great products you need for your swimming pool. Our highly trained and experienced sales consultants will exceed your expectations and partner with you regarding your swimming pool and aquatic facility needs. Count on our superior customer service, largest inventories, quickest shipping and extremely competitive prices.